This week, starting with this CW Renew/Cancel installment, the Watching category no longer exists. Two new categories have replaced the Watching category: Leans Cancelation and Leans Renewal. These two new categories help give us a better understanding on what a bubble show's fate would be. 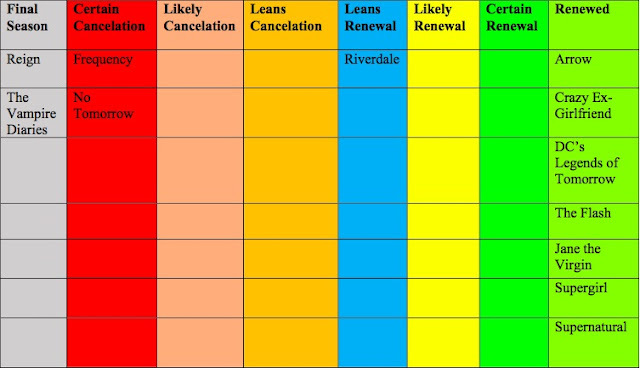 Riverdale has been downgraded to Leans Renewal for the moment. The reason being that studio ownership is in play. CBS shows get renewed at lower relative ratings levels than WB shows. Yet, the CW's falling ratings makes it relatively better. Again, I do not think that the network would cancel all three of their freshman shows. This gives another positive factor for Riverdale. It also depends on the relative performance of The 100, The Originals, and iZombie. This is why a slight downgrade is warranted.